ISLAMABAD: An unannounced decision of the economic coordination committee (ECC) of the federal cabinet to end all subsidies for electricity consumers has paved the way for a successful end to the talks in Dubai with the IMF and the release of the next tranche of $552 million by the agency. This is perhaps the most important of the decisions taken by the ECC, under the chairmanship of Finance Minister Ishaq Dar, on Jan 28, and will save the government over Rs200 billion that the subsidies were costing it. The politically unpopular decisions were approved ahead of the second IMF review meeting in Dubai from Feb 1 to Feb 9. It reviewed economic managers� performance on 15 benchmarks agreed upon with the fund. Mr Dar headed Pakistan�s delegation to the meeting. 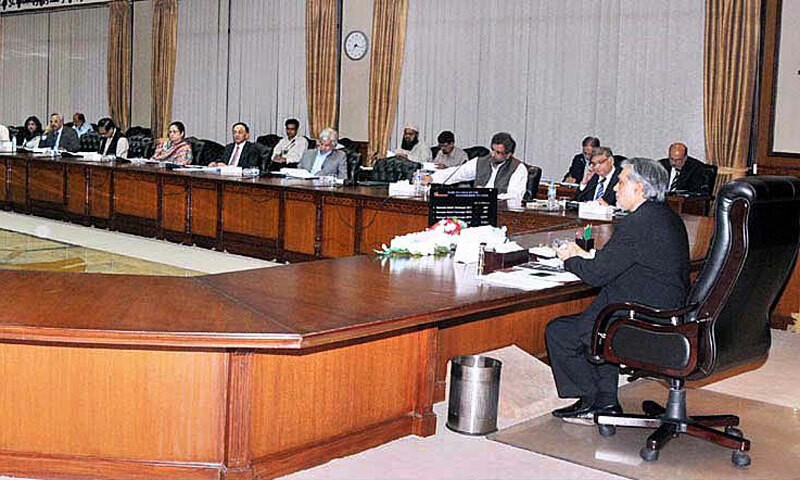 The ECC approved the National Tariff and Subsidy Policy Guidelines to end subsidies for domestic electricity consumers using above 200 units a month. The subsidy will also end for agriculture, commercial and industrial users. Officials familiar with the development say that the phase-wise withdrawal of subsidy may start in March, in line with the IMF condition. Others believe that implementation may be delayed until the budget for 2014-15. Two other important decisions were taken in the ECC meeting. These related to introduction of an equalisation surcharge to be collected from end consumers and collection of outstanding loans of distribution companies (Discos) from consumers. The equalisation surcharge will be introduced to maintain a uniform power tariff across the country. It is an inter-Discos subsidy. This means that the consumers concerned will bear the burden of inefficient Discos by paying the tariff differential amount. Currently, the National Electric Power Regulatory Authority (Nepra) determines the tariff for nine Discos separately. However, the tariff of the most efficient company has become the consumer tariff. The difference is borne by the government to create a uniform tariff. According to the new decision, the burden of maintaining the uniform tariff will be borne by consumers. Nepra will determine the amount of the equalisation charge, which will appear separately on the bills of customer categories. Through another decision, the government has bound Nepra to collect an outstanding loan of Rs130bn from consumers. The regulator has twice denied the collection of loans from consumers. These decisions are likely to be announced in the budget. LOADSHEDDING: The government also initiated revenue-based loadshedding for the six remaining electricity distribution companies last month as per the IMF condition. This means revenue collection will determine the extent of loadshedding in a given area � the more the collection, the less the loadshedding. Other decisions pertained to honouring the IMF conditions the government agreed to in the Dubai meeting to all structural benchmarks of the 36-month extended arrangement under the Extended Fund Facility (EFF) worth $6.64bn. A source close to the review meeting told Dawn that Islamabad was on target in terms of the implementation of IMF conditions and the achievement of benchmarks. Both sides discussed economic indicators and performance in terms of targets. The outcome of the decisions � which put consumers under tremendous pressure � secured the IMF team�s applause as well as appreciation for the finance minister and his team at the Dubai meeting. �We are absolutely on target, and the IMF is happy with the plans to move forward for the remaining year,� the source said, adding that no change in the timeline has been sought for implementation of the conditions. The source said that no new tax would be introduced in the second half of the current fiscal year. However, the Federal Board of Revenue (FBR) will have to broaden its tax base by issuing notices to 75,000 people by the end of next month. TAX NET: By the end of last month, the FBR had issued notices to nearly 70,000 people to bring them into the tax net. However, of these only 50 per cent (35,000 notices) were actually delivered; the rest remained undelivered. Of the delivered notices, second notices were issued to 10,000 people. Of these, assessments of only 5,000 people were carried out by the tax department to determine their due taxes. So far slightly over 4,000 people have actually filed tax returns, reflecting a very poor implementation of the tax-broadening drive. However, a senior tax official said the FBR was on track and would meet the IMF benchmark within the next couple of months. For the year 2013-14, the government had offered the IMF an assurance that 100,000 people would be brought into the tax net. The IMF has kept the annual FBR target of Rs2,478bn for 2013-14 unchanged. No downward revision was made in the revenue target. However, a shortfall of over Rs69bn was witnessed in the first seven months of the current fiscal year. The IMF was also given an assurance regarding finalisation of the three-year phase-wise withdrawal plan of tax exemptions worth Rs400bn under income tax, sales tax and customs duties. The government has already constituted a committee to finalise the plan, which will be implemented through SROs in the next budget. PRIVATISATION: Another important benchmark is of the privatisation plan. The source said Pakistan was on track and would hire three financial advisers for three public sector enterprises (PSEs) on the capital market transactions� list and three financial advisers for the three PSEs in the strategic private sector enterprises list for privatisation by the end of next month. The benchmark regarding the autonomy of the central bank will also be met by March. Pakistan�s structural benchmarks under the EFF cover the fiscal sector, the monetary sector, the financial sector, structural policies, and new structural benchmarks.